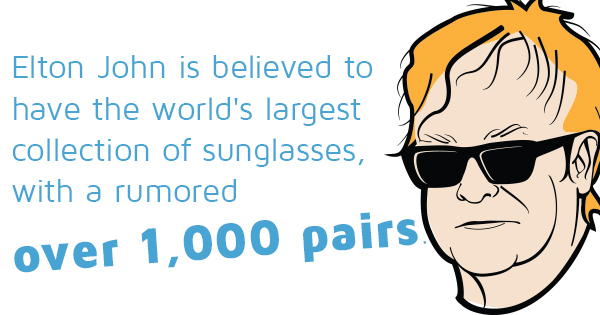 Elton John is believed to have the world’s largest collection of sunglasses, with a rumored over 1,000 pairs. Though Sir Elton certainly has more shades than the average person, anyone can pick up a pair and start drastically improving their fashion sense. Oakley Offshoot lenses, for instance, can look great on anyone. These lenses are great for athletic competitions and do a wonderful job of not only looking great but blocking out the sun’s harmful ultraviolet rays. In addition to Oakley Offshoot lenses, there are plenty of iconic shades that have been providing practical and aesthetic benefits for decades. Aviator — Aviators were first constructed in the 1930s for World War II pilots to better see during flights. The most distinctive feature of these shades is their extremely thin wire frames. Round — Round frame shades look extremely retro, but they really came to be during the 1990s. These shades are smaller and much more minimalist compared to sunglasses of previous decades. Though Elton John has over 1,000 pairs of sunglasses, 999 of them are round frames. Okay, that’s not true but he definitely helped put that style on the map. Wayfarer — Ray-Ban’s most iconic product, the Wayfarer, has been on the market since 1953 and is reported to be the best-selling style in history. The Wayfarer has been remodeled by various brands and was made famous by tons of celebrities, including the Blues Brothers and the majority of the cast of Reservoir Dogs. Mirrored — Also known as reflective shades, these have been popular ever sense Morpheus started donning them in The Matrix. These shades can offer quite a bold look but will work great to combat the sun’s harmful rays. If you want to learn more or find some quality Oakley Offshoot lenses, Oakley M Frame lenses, Oakley Batwolf lenses, Oakley Frogskin lenses, or find any kind of Oakley replacement lenses in order to look and feel your best, give Galaxy Lense a call today!